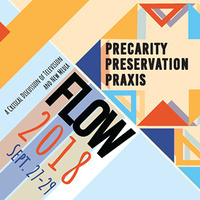 Running Sept. 27-29, the 2018 Flow Conference features discussions of current trends and debates in television and new media studies. The conference is FREE to UT Austin faculty, staff and students. a featured roundtable, Praxis in Practice (Sept. 28, 11 a.m.). Graduate students from the Department of Radio-Television-Film organize the biennial conference.